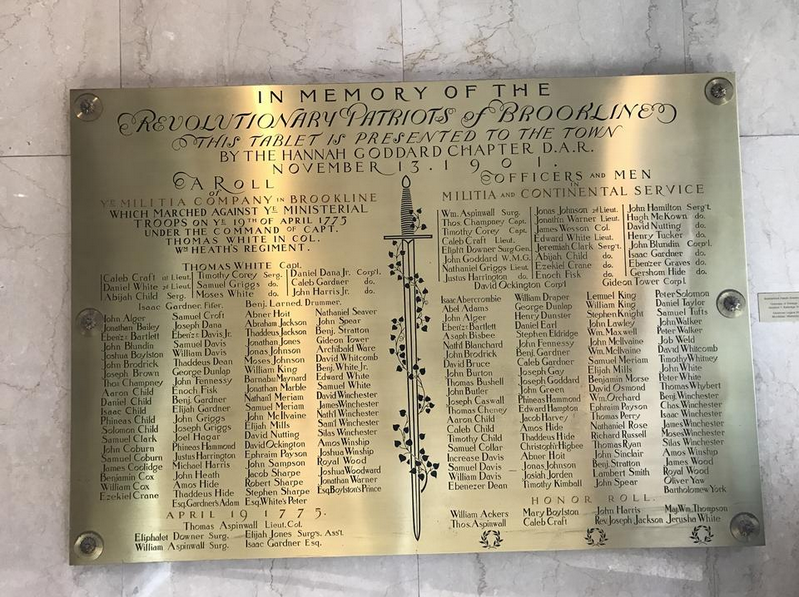 Bearing several veterans memorial plaques, the lobby walls of Town Hall serve as a tribute to Brookline’s many veterans, and as a testament to the town’s history. Included in that history are the little-known stories of three enslaved men who marched to the Battle of Lexington in April 1775. When Brookline’s Barbara Brown learned that the names of slaves were included on the Battle of Lexington plaque, she rushed to Town Hall to see for herself. For a while Brown just stared. Then she headed straight to the Brookline Public Library to see what she could learn about Adam, Peter and Prince. On April 25, the town, in partnership with the Hidden Brookline Committee, the Brookline American Legion Post 11 and the Brookline Veterans of Foreign Wars, Stephen F. Rutledge Post, will honor Adam, Peter and Prince during a ceremony at the flagpole in front of Brookline High School. Facilitated by Town Meeting member Neil Gordon, who helps organize memorial ceremonies for local veterans, the ceremony will include a spiritual, a national song and a brief talk about Adam, Peter and Prince. Though these ceremonies are traditionally meant to bring closure to the friends and family of the veterans, closure isn’t the motivator behind this ceremony. Rather, it is meant not just to honor these men and their part in Brookline’s history, but to also educate. “This isn’t closure, this is the opportunity to recognize one facet of these three men’s lives and honor them as Brookline veterans,” Gordon said. The ceremony’s location at the high school is a part of that goal to educate. For Brookline High teacher and emcee for the ceremony Malcolm Cawthorne, the idea to include students stemmed from the notion that young people should learn about all aspects of Massachusetts’ history, including the fact that the state once had slaves. “It’s something very important for every student to hear,” Cawthorne said. As members of Hidden Brookline, an organization dedicated to uncovering the history of slavery and freedom in Brookline, Brown and Cawthorne quickly joined Gordon’s efforts to organize a memorial for Adam, Peter and Prince. “Not only can we do this but we must do this because it’s a part of what we are as a town, and we need to honor that past and honor those people that suffered in that past,” said Brown. Not much is known about Adam, Peter and Prince. Most of the information that Brown found related to their owners but did not shed much light on Adam, Peter and Prince themselves. Even their names said more about their owners. According to Brown, owners typically chose from three categories of names – biblical names like Peter and Adam reflected the Christian nature of their owners, classical names like Venus showed how educated their owners were and other names, like Prince, were considered mocking names. While the plaque indicates that all three men marched to the Battle of Lexington, there is no information on what the men actually did there or why they went. Beyond his march to the Battle of Lexington, Adam’s burial location is the only other known fact. According to Brown, Adam was buried in the town cemetery, likely in an unmarked grave. By contrast, much is known about his owner who died in one of the skirmishes during the battle and was buried in the town cemetery at a marked site. Only one fact is known about Peter – that he marched to the Battle of Lexington on April 19, 1775. Even information like when or where he died is a mystery, Brown said. The most information is known about Prince. A slave of Joshua Boylston, Prince escaped to freedom two years after the battle. According to Brown, record of Prince’s escape exists in an advertisement that Boylston took out in a Boston paper, offering an award to anyone who found him and reminding others that is was illegal to help or harbor a slave. “For Prince to do what he did was extremely dangerous because if he were caught, the typical punishment was he might be sent away or he might be badly punished [physically],” said Brown. It is believed that Prince went to Salem, a community that also had slavery, to board a ship where he could get some distance, according to Brown. After Prince’s escape there is no other record of him or what happened. The ceremony to honor Adam, Peter and Prince will be held on April 25 from 9:45 to 10:15 a.m. by the flag pole in front of Brookline High School.